The product you want to order is in stock. All orders are delivered within 24 hours after they are placed. Unique Circular Shape: the music spectrum composed of an inner circle and an outer circle. Good Visual Effect: combines of 135 white highlight 0805 LEDs and 10 full-color 5050 LEDs to create two visual effects. 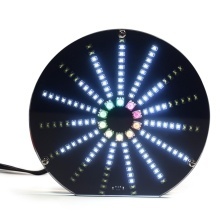 Outer Spectrum Effect: 4 different outer circle LED spectrum bounce effects adjustable. and 4 levels of different enhancements optional. Inner Spectrum Effect: inner circles can produce different color variations according to different music beats. Front Panel: translucent black acrylic front panel reduces external light interference while preventing high brightness from causing glare. Easy to Operate: only one touch button sets different functions. Dual Audio Input Design: two data input cable combinations reduce signal interference. USB DC 5V voltage supply. You will get a DIY kit, all components need to be soldered by yourself.